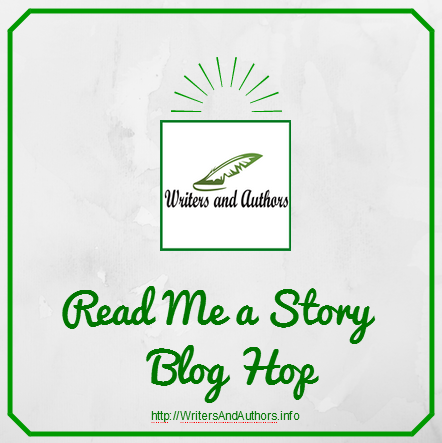 Welcome to the "Read Me a Story Blog Hop"
Anyone can link up to this blog hop. Aren't blog hops/blog link up parties just great?! They give you the opportunity to meet other great people who have similar interests to you. Networking awesomeness! In this blog hop you'll be able to find out about fantastic books and sample them. Read excerpts and/or watch as the authors read you a piece from their book. AUTHORS this is your chance to show off your talent. Make a blog post on your own site where you share an excerpt from your book. This can be a written excerpt of you might decide to embed a YouTube video of you doing a short reading from the book instead. Which ever you prefer. Make sure you include a link to where your book can be purchased in the blog post so that readers know where they can get a copy. Please visit AT LEAST TWO OTHER LINKS from the Hop and leave them some love in the form of a comment. We are trying to build a community of bloggers, readers, authors, and others who are as passionate about literature, so please CONNECT and follow any or all of the blogs that interest you! If you like, grab the image above and put it somewhere on your blog, preferably the post you’re linking up. If you’d prefer, you can just add a text link back to this Hop so that others can find it and check out all these great book links! The Blog Hop will remain active until 8th September so make sure you check back through out the week for new entries.